This is a resource to help you determine whether your small group is fulfilling its purpose. Use this in conjunction with the book "Brothers! Calling Men Into Vital Relationships". Whether your men's small group is just beginning or has been together for several years, you should go through the following three step process every six months (or once a year at a minimum). Step One: "Why are we meeting?" The following three questions will help you to answer "why". 1 What is the purpose for which God has led your group together? 2 What do you hope to accomplish in your men's small group? 3 How will you know if your group's purpose is being accomplished? Step Two: "What does our group look like?" 1 Who are faithful men (11 Timothy 2:2) that either could be or are currently in your small group? If you are just beginning, pray that God will help you to identify men who should be involved. 2 What materials are you going to use to help accomplish your group's purpose? Review Step One to help you with this decision. 3 When and where is your group meeting each week, and for how many months? 4 How is your group doing as you spend time seeking to accomplish the purpose for which God has called you together? A What characterises the beginning of your small group time? B What do you focus on during the main part of your time together? C How would you describe the conclusion of your time together? E Do you have a balance between relationship building, applying God's Word to your lives, and praying together? Adjust your group time to achieve this balance. 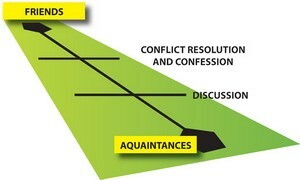 Step Three: "Where are we at in our relationships?" As part of a proper balance, relationships provide an environment through which change can take place in the lives of the men in your group. The following questions from the book Brothers! will help you to identify where your small group is at in your relationships with one another. Proceed by answering the questions below until you reach a level where you cannot answer "yes" to all three questions from a "base". This identifies the level of relationship that your group is working on. 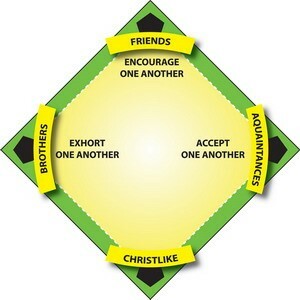 (If you're just beginning your men's small group, you are moving toward becoming acquaintances, i.e., "first base".) Note: Your group will usually be on a "base path" between two of the bases. A Has communication moved from guarded to relaxed? B Are you beginning to know the others as people, where they have come from and where they are now? C Is the group communicating a desire to move on to the next step? If so, the group is ready to "slide into second". A Has communication opened up and moved into the area of sharing deeply held opinions? B Have some conflicts arisen and been resolved? C Do we feel there is mutual respect and trust among the members of the group? If so, we're ready for some teamwork as we head for third. A Are we learning from each other's strengths? B Are we learning to work together? C Have we begun to allow the group to hold us accountable? Now that you have gone through the three step process and identified the level of relationship that your group is working on, you are ready to focus on what you need to do to grow relationally in order to accomplish your group's purpose. All three are needed, but the focus on each element will be different depending on where your group is at in the "relational diamond". You've identified the level of relationship (i.e., the base path) that your group is working on through the three step process. Proceed by answering the questions below which correspond to the next relational base your group is trying to reach. This will help you evaluate how your small group is growing relationally, and whether to adjust it according to your group's purpose. Note: When your group has crossed the next base, then you are ready to move toward a new base. Be sure to re-evaluate where you're at relationally by asking the questions in Step Three. 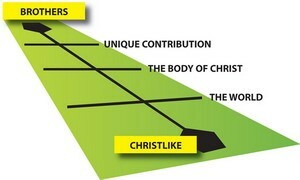 You are on your way to becoming Christlike! How can you adjust your small group format to balance these two key elements? 2 What are some ways that your group demonstrates genuine acceptance, without prejudgement, for each man in it. 3 Why is it important for your group to listen and empathise with what each man shares? How can you do that? Has your group agreed to a "covenant of confidentiality"? 4 What are some enjoyable activities your group can do together to get better acquainted? 5 How much time does your group spend together in God's Word? What are some ways you can begin to serve one another in your group? 6 Will your group remain "open" or become "closed" to adding new members? Why? How can you adjust your small group format to include this key element? 2 What open-ended, progressive questions are you sharing that will help your group to develop a deeper understanding? 3 Is your group moving toward a deeper relational commitment? Does each man in your group sense the freedom to share how he really feels? Why or why not? 4 What differences of opinion are you encountering in your group? Are you using those differences as an opportunity to develop mutual respect for one another? How? 5 What are some ways your group can serve the needs of your families and friends? What is your group doing that demonstrates your interdependence as brothers? 2 What covenants / commitments are you making to God and to one another in your group? (see Brothers! Page 51). 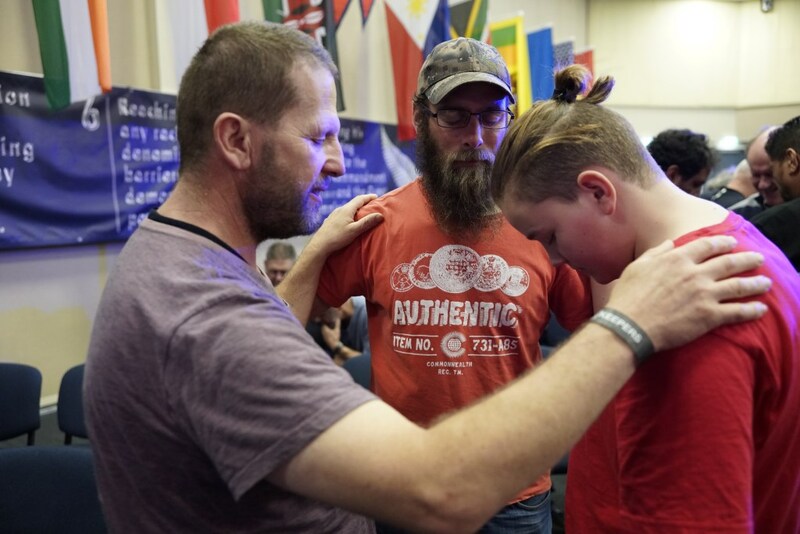 How often are you praying together about the convenants / commitments you have made? 3 Who in your group can you ask to regularly check and see that you are following through on those commitments you've made to God / each other? 4 In what ways are you demonstrating transparency to your group when you've failed to honour your commitments? (James 5:16). How is your group involved in helping you when you've failed? 5 Does your group enjoy worshipping the Lord together? How are you moving toward a deeper understanding and application of God's Word in your lives? 2 In what ways are you reaching out to your community and its need to know Jesus Christ? Has your group undertaken any community projects? 3 Is your group leadership shared or focused on one person? 4 If you are the group leader, who else in your group can you encourage to lead and how soon? 5 Can each man in your group identify God's calling for his life and what his gifts and talents are to help fulfil that call? 6 How does your group rely on one another's gifts and talents to accomplish your purpose as a group? 7 Has your group accomplished the purpose for which God led you together? (Step One). Is there anything else you need to do? As we conclude, keep in mind that men's small groups are dynamic, not static. In other words, you should expect God will change your life and other men's lives in the group(s). This means the purpose for your men's small group(s) may change as you grow in your relationship with Christ and one another. 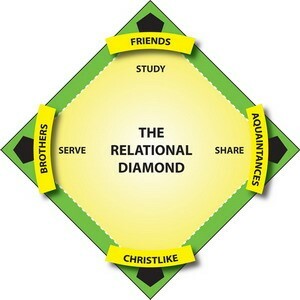 It also means not every man will go around all four bases of the "relational diamond". Other related issues are discussed in chapter 8 of the book Brothers!